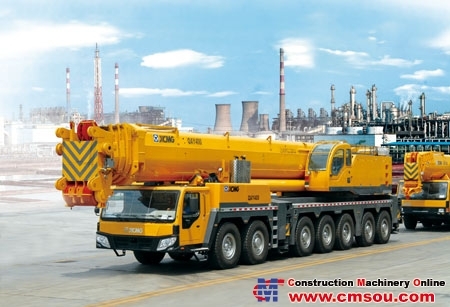 The product adopts 7-axle all terrain chassis, 5-segment oval-section jib, and single-cylinder no-rope automatic stretch and retract system. It has optional self-loading and unloading super-lift device, fixed extension jib, and luffing jib, featuring large working scope and strong lifting performance. The working radius can reach 96m, and the lifting height can reach 120m. The combined self-support counterweight device which can load and unload by itself makes the connection more convenient, safer, and more reliable. Adopt the closed hydraulic system, power management function of the multi-pump system, featuring more stable operation and good slight mobility. The application of the computer integrated control technique and the CAN-BUS control network improve the intelligent level and advancement of the product. The pressure memory function, motor stalleddescent inspection, and speed control in different working conditions make the product safer and more reliable.